This study was conducted to assess the level of stress among diamond workers with respect to their job task. Three hundred and forty-two diamond workers were enrolled from Ahmedabad, Gujarat, with age ranging between 18 and 60 years, belonging to five different job tasks – ghat tarasi (N = 37), table cutting (N = 35), talia bottom (N = 123), athpel (N = 78), and mathala (N = 69). 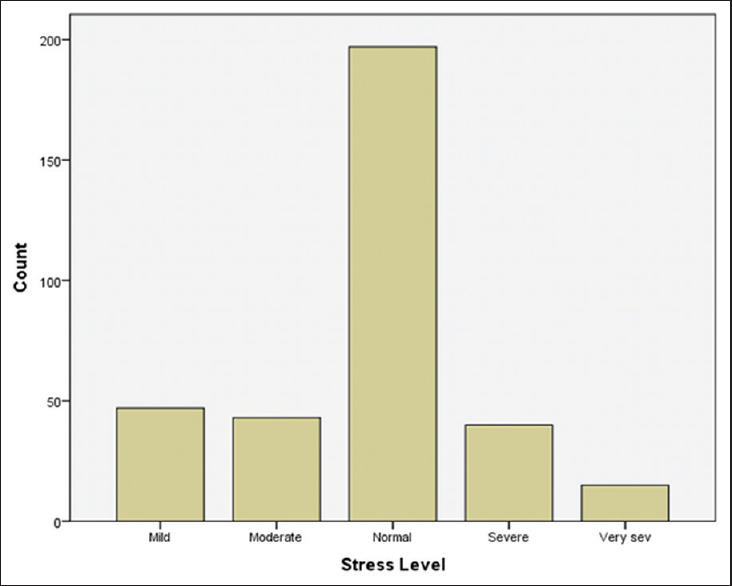 Depression anxiety stress scale (DASS) was used to assess the level of stress among diamond workers. Results showed a mild level of stress (M = 15.41, SD = 8.7) among diamond workers. One-way analysis of variance (ANOVA) revealed no significant difference in stress scores across different job tasks except ghat tarasi workers. Ghat tarasi workers did not exhibit stress. Hence, the level of stress among diamond workers have not been significantly influenced by their job task apart from ghat tarasi workers. E-waste being hazardous in nature demands scientific management thereby protecting and safeguarding the health of the workers. A major chunk of e-waste ends up in informal sectors where crude methods are employed thereby risking the health of workers. The current scoping review, Based on Arksey and O'Malley's framework was done to explore the available literature to summarize the perceived and manifested health problems among informal e-waste workers. 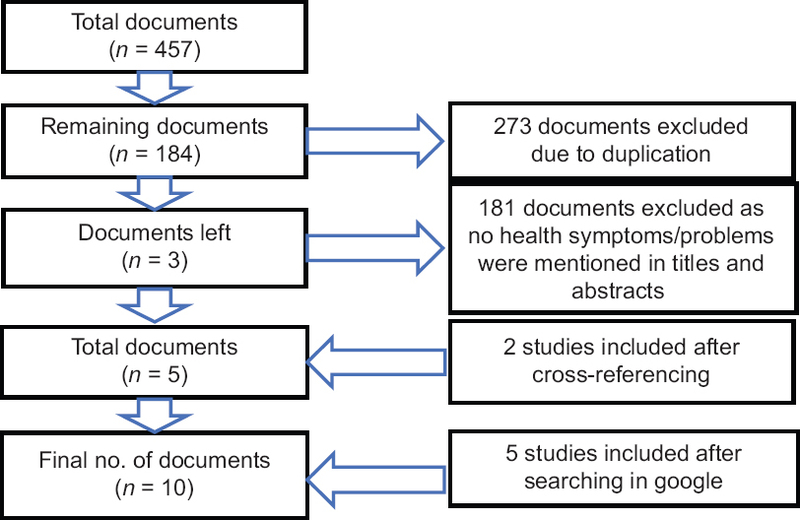 A literature search was done in three databases namely PubMed, Web of Science and ScienceDirect between 1/01/2010 and 1/01/2018. All the titles and abstracts were scrutinized to include only those studies on the basis of health symptoms/problems among workers. Health problems, thus explored, were categorized into five broad categories- physical injuries, respiratory, skin, musculoskeletal, and other general health problems. Major factors which could be related to health problems were job designation, age, non-usage of personal protective equipment, exposure to dust, and hazardous chemicals. Context: Every year, more than 4 million people die from injuries worldwide. India reported 413,457 deaths due to unintentional injuries in 2015. Manufacturing industry is a major contributor to injury morbidity and mortality. Aims: This study aims to estimate the burden of industrial injuries in Dadra and Nagar Haveli, India. Settings and Design: Dadra and Nagar Haveli is a small territory spread over 491 sq. km, having a population of 343,709 as per 2011 population census. Methods and Materials: The two-sample capture-recapture method was used for ascertainment of fatal and non-fatal injuries reported from 1st January to 31st December 2017. The first capture was data of injuries extracted from First Information Reports registered by the police. The recapture was data of injuries reported by the government health facilities. Statistical Analysis Used: Chapman estimator was used to derive total fatal and non-fatal injuries. An analysis was done using Microsoft Excel software. Results: According to police records, there were nine fatal and eight non-fatal injuries during the study period. Health facilities reported 21 fatal and 113 non-fatal injuries. Six cases of fatal and 3 cases of non-fatal injuries were found in both the data sources. The capture-recapture analysis estimated 30 fatal (95% CI: 20 to 40) and 225 non-fatal injuries (95% CI: 90 to 420). Conclusions: Both records of police and government health facilities underestimate fatal and non-fatal injuries with under-reporting more pronounced in police records. Background: Manifestation of certain health morbidity in copper dust–exposed subjects impels us to obtain a cogent view regarding the implicate relationship of immunoglobulin on health risk assessment in them. We present here immunological profile of copper pit worker and office employees residing in the vicinity. Rationale of this study is to delineate the risk factors involved for copper toxicity. Materials and Methods: Copper mine workers (n = 87) were selected from a copper mine at Malanjkhand. Blood metal concentration and immunological profile such as IgG, IgM, IgA, and IgE were analyzed from these subjects. Data analysis was carried out using proper statistical tools. Results: Chronically copper dust–exposed miners (N = 71) and office employees (N = 47) exhibited significantly higher contents of copper (P < 0.0001) when compared with normal control. 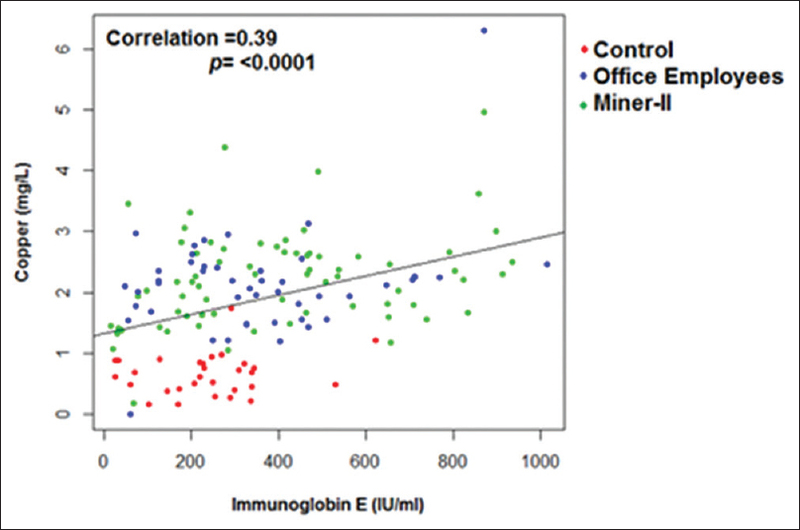 Serum IgG and IgA were found to be elevated significantly (P < 0.0001) in them when compared with both office employees and normal control. Contrarily, significant decrease in serum IgM was observed in both the groups when compared with normal control (P < 0.0001). Serum IgE was found to be elevated more significantly only in miner when compared with normal control. Copper exhibited significant positive Pearson's correlation coefficient with IgE, IgG, and IgA (r = 0.39; r = 0.28; r = 0.21) but negative correlation (r = −0.39) with IgM. Odds ratio analysis validated that elevated levels of IgE in miner and decrease in levels of IgM in both groups were truly affected by increase in copper levels from normal to abnormal. Conclusion: Miners are prone to morbidity such as type 2 diabetes and respiratory discomfort (asthma and hypersensitivity) since imbalance in both IgM and IgE is known to be associated with such morbidity. Immunopathy observed in chronically exposed miners could be attributed to copper toxicity in them. Context: Elevated blood pressure and alterations in lipid and lipoproteins play a major role in the development and progression of cardiovascular diseases. Aim: This study is aimed at determining the blood pressure and lipid profile in automechanics. Settings and Design: A total of 120 male subjects between 18 and 55 years of age comprised 60 automechanics and 60 age-matched occupationally unexposed control subjects in Emene, Enugu State, Nigeria. Subjects and Methods: Four milliliters of fasting blood samples was collected from all subjects, 2 mL of blood was dispensed into K2-EDTA vacutainer tube for blood lead analysis, while the other 2 mL was dispensed into plain vacutainer tube, allowed to retract, centrifuged, and the serum used for serum lipid profile analysis. Blood pressure was measured using aneroid sphygmomanometer. Statistical Analysis: Statistical Package for Social Sciences (SPSS) version 21.0 was used for data analysis. Results: Automechanics had significantly higher values of systolic and diastolic blood pressures compared with the controls. Serum levels of total cholesterol (TC), low-density lipoprotein cholesterol (LDL-C), very low-density lipoprotein cholesterol (VLDL-C), and triglyceride (TG) were also significantly higher in the automechanics compared with the controls (P < 0.05); serum high-density lipoprotein cholesterol (HDL-C) level, however, did not differ significantly between the two groups (P > 0.05). Blood lead level showed a significant positive correlation (P < 0.05) with systolic and diastolic blood pressures, serum TC, LDL-C, VLDL-C, and TG, with no significant correlation with serum HDL-C (P > 0.05) in the automechanics and no correlation in the controls. Conclusion: The result of this study indicates that blood pressure is elevated and lipid profile altered in automechanics which suggests that these groups of workers are prone to increased risk of developing hypertension and cardiovascular disorders due to occupational exposure to lead. Background: Farmers are extensively using pesticides for pest control in agriculture. Their precarious handling practices may lead to higher exposure resulting in adverse health effects. Aim: Current study was aimed to evaluate the knowledge, attitude and practices regarding pesticide usage and its toxic effects by farmers. Settings and Design: Cross sectional, Study Setting: Rural village in south Karnataka. Materials and Methods: Sample size: 171 farmers, Data collection: face to face standardized validated questionnaire. Statistical Analysis: Chi-square test. Results: A total of 118 males and 53 females participated in this study with median age of 40 years. About 61% of the farmers knew the harmful effects of pesticides. However, 22% of them were mixing the pesticides using their bare hands and 26% were not wearing any protective clothing during spraying pesticides. Around 67% were carelessly disposing the leftover pesticides in the open fields. Skin problems and neurological system disturbances were the most common pesticide related health symptoms. Equipment washing practices (P < 0.05) and protective clothing (P < 0.03) were significant predictors of health related problems. Significant associations were found between the occurrence of headache and equipment washing practices (P < 0.03), storage of pesticide remains (P < 0.02) and protective clothing (P < 0.01). Conclusion: These findings showed that knowledge level is adequate among farmers but this did not reflect in their practice. There is a need for continuous pesticide safety education along with training to the farmers regarding use of personal protective devices, personal hygiene and sanitation practices during and after application of pesticides. Background: Veterinary staff and students could be exposed to formaldehyde – a ubiquitous agent, common cause of contact allergy. 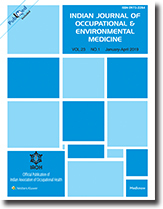 Aim: To evaluate the incidence of contact sensitization to formaldehyde in exposures in veterinary medicine. Settings and Design: A cross-sectional study was conducted during July–December 2017. Materials and Methods: A total of 206 individuals were included, patch tested with formaldehyde 1.0%/aq – 36 veterinary medicine students, 20 veterinarians, 47 students and 28 trainees of dental medicine, 41 dental professionals, and 35 non-occupationally exposed individuals. Results: The incidence of contact sensitization to formaldehyde among the whole studied population was 48.1%, highest being among the students of veterinary medicine (94.4%) and the veterinarians (85%). With very high significance, the sensitization incidence was higher in the groups of students of veterinary medicine and veterinarians, if compared to the control group (P < 0.001); (P = 0.004), dental professionals (P < 0.001); (P = 0.001), trainees of dental medicine (P < 0.001); (P = 0.005), and students of dental medicine three-fourth year of education (P < 0.001); (P = 0.001). Significantly, higher was the incidence of contact allergy in the control group if compared to those of dental professionals (P = 0.033) and dental students three-fourth year of education (P = 0.028). Conclusions: The exposure to formaldehyde during the education in veterinary medicine and practice could be an important risk factor for the onset of contact sensitization. Stricter preventive measures are needed to reduce veterinary student's and lecturer's exposures. Equipment of dissection tables with local exhaust ventilation system could reduce the concentration of formaldehyde in the gross anatomy laboratory. Background: Pesticides have critical effects on human health. Because of the high amount of pesticides used, individual exposure is almost inevitable. According to the above-mentioned issues, few studies have been done in this area in Iran. Therefore, this study was conducted to evaluate the knowledge, attitude, and practice of pesticides use among farmers in Kabudrahang County, Hamadan Province, Iran. Materials and Methods: This cross-sectional study was conducted in Kabudrahang County. Data were collected from 262 farmer's sprayer, during April to July 2016. Data were collected, using convenience sampling through interviews with the farmers who had spryer during period spraying. Data collection instrument was a questionnaire that included three sections. Content validity ratio and content validity index indicators were used to measure the validity of questionnaire used from. Data were recorded in SPSS version 21.0 (SPSS Inc., Chicago, Illinois) and were analyzed using frequency analysis and Pearson correlation test. Results: Burning eyes and dizziness were the greater symptoms of poisoning with pesticides. Overall, most of them did not have proper knowledge. Many farmers had proper attitudes toward the use of personal protective equipment. However, 37.4% of them reported that the use of personal protective equipment is not easy. The farmers' practice toward the use of the personal protective equipment correlated with their knowledge and attitude (P < 0.001). Conclusion: It is proposed that educational sets consisted of acquaintance with poisons and their applications, storage, and carrying the pesticides, the methods for effective of different individual protection facilities, and utilizing the behavior to reduce the exposure to poisons should be developed and be available to farmers. Context: Upper crossed syndrome is caused by weakness in one group of muscles and tightness in other group of muscles. Deep-neck flexor weakness and tight pectorals and sternocleidomastoid contribute to this syndrome. This syndrome mainly arises as a result of muscular imbalance that usually develops between weak and tonic muscles. Laundry workers tend to develop this syndrome due to the nature of their work. Aims: The aim of the study is to find the prevalence of upper crossed syndrome in laundry workers. Subjects and Methods: A prevalence study was conducted among laundry workers. Laundry workers were selected by random sampling method. They were assessed by performing various special tests for tightness and weakness of the muscles. Oswestry neck disability index questionnaire was then filled up by the population included. Results: Data from fifty laundry workers were obtained and analyzed. The symptoms of upper crossed syndrome were present (n = 14) in the population with mild neck disability (n = 4) and moderate neck disability (n = 11) and no disability (n = 35). Conclusions: These findings reported in the study provide a better understanding of impact and the extent of upper crossed syndrome. We found out that there is a significant prevalence of upper crossed syndrome in laundry workers. Neck pain presents as the main symptom, and these patients also present with forward head-and-neck posture.